Mobility and accessibility improvements are pressing onward in the Halifax Regional Municipality. Halifax Transit and the HRM awarded a contract for new buses to Nova Bus Ltd. in May, and the new vehicles are starting to arrive. However, some advocates say, accessible buses don’t mean much when transit users are forced to trudge through snow piles just to get to the door. Following a snowstorm earlier this month that ended on Jan. 8, some of the accessibility improvements on buses can’t overcome snow removal concerns. Timelines on the HRM’s Snow Operations page indicate that bus stops have the lowest priority for scheduled snow clearing. The page says the bus stops should be cleared by 48 hours after the end of a weather event, at the latest. District 7 Councillor Waye Mason says snow removal is sometimes done faster, but timelines depend on the situation. Streets and sidewalks are expected to be cleared by 36 hours after a weather event. This means that all streets and sidewalks, from high traffic arteries like Robie Street to gravel lanes in the suburbs of the HRM, are targeted for clearing before bus stops. Even though it may take a while, making room for a bus to pull over isn’t the only requirement for snow clearing. A space for loading the bus at its front doors must also be cleared, but the specifics of how long that zone should be isn’t stated on the Snow Operations website. Jeff Blair, a volunteer with transit advocacy group It’s More Than Buses, says the current snow-free spaces he sees aren’t big enough. Unlike suburban areas, stops in the downtown core or more urban streets don’t have green spaces on curbs that snow can be pushed onto. “Some more urban stops will have snow entirely removed; it can’t be stored,” says Chase. However, removing snow rather than clearing it requires heavier and more expensive machinery that stops traffic. “Removal is a proactive measure, given the budget that we have,” says Chase. She says that heavier equipment “is on retainer and not needed every time,” which reduces maintenance costs. Mason and Craig are also paying more attention as current and outgoing members, respectively, of the HRM’s Accessibility Advisory Committee. The committee identifies accessibility issues the public might encounter, including those that occur using transit. 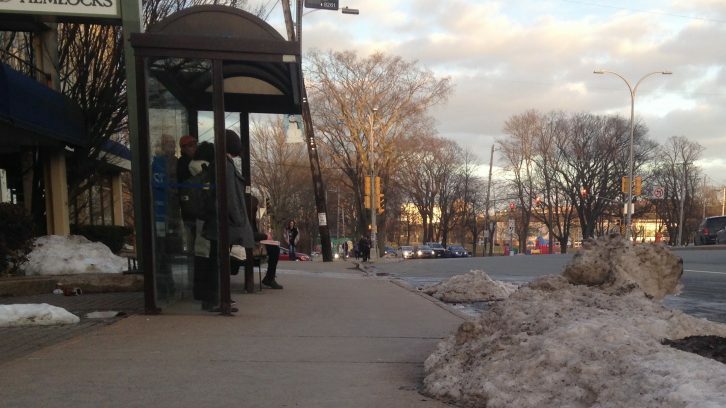 To combat the current low priority standard for bus stops, Mason thinks Halifax should take note from other Canadian cities. However, he also says things are getting better. As a frequent transit user, he has noticed a significant difference in this week’s snowstorm over previous winters in the HRM.